I started music education by the age of four and specialized on the “Oud” an Arabic music instrument by the age of ten. I continued my academic musical studies in the “Higher Institute of Music” in Damascus. I established “Awj” ensemble for Arabic music with the help of my violinist colleague in Damascus in 2008. We were experimenting with mixing a traditional Arabic music set called the “Takht” with a string quartet performing our own compositions. 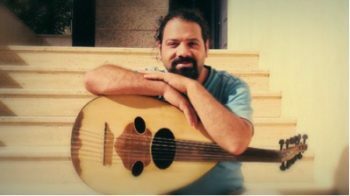 After the war broke out in Syria, I fled to Turkey where with the help of twelve Turkish and Syrian musicians we established “Hayal Band,” a musical fusion of the Middle East. In “Hayal Band” we rearranged pieces from the Turkish, Arabic, Kurdish, Armenian, and Georgian heritages and performed it to the audience to stress the common relations between the peoples of the Middle East in this very difficult time. In the same time I established a trio called “Saba Barada” with two other musicians, were we performed our own compositions and songs in Istanbul, Gaziantep, and Antakia in Turkey – emphasizing freedom, life, and liberty. I have performed many solo concerts including three concerts since I moved to Germany in June 2016 in both Bavaria and Berlin, and I am planning to record my first album of my compositions and songs.